What is the LIPs Commission? Earth history is punctuated by short duration events (or dramatic pulses in longer duration events) during which large volumes of mainly mafic magmas were generated and emplaced by processes unrelated to “normal” sea-floor spreading and subduction. These Large Igneous Provinces (LIPs) are best preserved in the Mesozoic and Cenozoic where they occur as continental flood basalts, volcanic rifted margins, oceanic plateaus, and ocean basin flood basalts. Silicic rocks may also be associated. Many LIPs can be linked to regional-scale uplift, continental rifting and breakup, and climatic shifts. In the Paleozoic and Proterozoic, LIPs are typically deeply eroded. They are represented by deep-level plumbing systems consisting of giant dyke swarms, sill provinces and layered intrusions. In the Archean the most promising LIP candidates are greenstone belts containing komatiites. Large Igneous Provinces of the Circum-Pacific region (in red) emplaced since 250 Ma. From cover of Mahoney, J.J. and M.F. Coffin (eds. ), Large Igneous Provinces: Continental, oceanic, and planetary flood volcanism. Amer. Geophys. Union Geophys. Mon. 100: 438 p., 1997. The LIPs Commission was established to promote interest in large igneous provinces, encourage research, and foster global collaboration among earth scientists. It is one of several commissions under the umbrella of the International Association of Volcanology and Chemistry of the Earth’s Interior (IAVCEI; http://www.iavcei.org/). The interests of LIPs Commission members range widely. The Commission links many geoscience disciplines and applies the broadest range of expertise to specific problems. The LIPs Commission was formed in 1993, as the scale and importance of LIPs in Earth history was appreciated, and the need for an international multidisciplinary effort recognized. Led by Drs. Mike Coffin and John Mahoney between 1993 and1998, the study of LIPs expanded, particularly that of oceanic plateaus and ocean basin flood basalts. An important publication was: Mahoney & Coffin (eds.) Large Igneous Provinces: Continental, Oceanic and Planetary Flood Volcanism. AGU Geophys. Mon. 100, 1997. From 2003 to 2013 it has been co-led by Drs. Richard Ernst and Ian Campbell, with a focus on LIPs through time, planetary LIPs and the debate on mantle plume vs. non-plume origins for LIPs. Assessing Archean greenstone belts in a LIP context. Geophysics of LIPs; impact origin of LIPs. Secular changes in LIPs and their mantle sources; distinguishing oceanic LIPs from oceanic crust (ophiolites). Environmental effects of LIPs (with focus on climatic effects of trap generated aerosols). Assessing plume and alternative models for LIP generation. 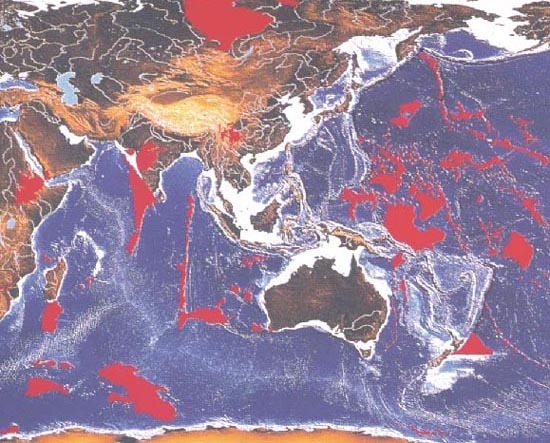 Oceanic plateaus, with a focus on deformed/accreted examples. Mantle convection modeling and implications for generation of LIPs, with a focus on the role of lithospheric mantle. Superplumes and the integration of plate tectonic and plume tectonic systems. LIPs through time and links with ore deposits. Links between LIPs and breakup of the supercontinent Gondwana. Experimental petrology and implications for LIP generation, with a focus on the role of eclogite. Environmental and climatic effects of LIPs. Mechanisms for the emplacement of LIPs; planetary LIPs. U-Pb dating and paleomagnetism of mafic units and implications for paleocontinental reconstructions. Domal uplift and regional variation in LIP geochemistry: tools for assessing plume involvement.